With a brief run ashore to Gibraltar to re-victual with essential supplies we slipped our lines at 11.30, winds very light and unable to carry sails we motor-sailed out into the straights of Gibraltar and turned into the Mediterranean. Our destination was Almeria however due to a weather window the Skipper decided it was prudent to push on to Cartagena some 50Nm further north. Whilst the weather remained calm the Skipper decided to demonstrate the finer points of seamanship including water conservation and proceeded by washing some pans over the side using a rope tied to the handle, an enthusiastic Dixie always looking impress, decided to go one better – Dixie demonstrated how to eliminate pan washing completely – in Dixie’s defence – the bowline was still intact when the line was hauled aboard albeit missing the pan – one assumes that the handle departed and the pan joined the galley of Davey Jone’s Locker. Robo a keen sea fisherman enthusiastically assembled the Army Air Corp, boat rod and reel and loaded it with a deadly cocktail of lures and feathers, Robo proclaiming loudly that a fish would have to be blind not to want take a big bite of at least one of the lures – we were all anticipating a luxury fish pie for supper that evening – 2 days later the anticipation of any kind of fish let alone a pie is starting to wear rather thin. 24 hours at sea and the wind backed and picked up from astern, time to demonstrate “goosewing” sailing. Soon we were gliding through the deep blue Mediterranean sea at 7.5kn with barley a swell to upstage our now confident novice helmsmen who are all holding a course within 5° swing. However all good things come to an end and so did he wind, not only did it go, but what little there was swung through 180° – goose-wing to beating all within the hour. Wildlife observations over 48hrs included a large turtle, an even larger Sun Fish (now that’s one odd looking fish, one thinks he was created with left over parts when the creatures of the ocean were designed). Numerous pods of Dolphins came – played and went. In fact after the 2nd day of the dolphins the excitement and euphoria of seeing the dolphins for the first time turned rather nonchalant over the following days. We must have a mouse on-board(and a nocturnal one at that) – because that’s the only logical explanation for savouries and snacks to be mysteriously disappearing particularly on night watch. Anyway, the Skipper came up with blinding solutions – prepack the night time snacks names into mouse-proof plastic containers and mark them up Red Watch & Blue watch. Genius!! Night 2 saw the winds pick up to a steady NE 4-5 – Cartagena, our port of destination lay precisely NE of our location (of course it did – This is AT isn’t it !!). 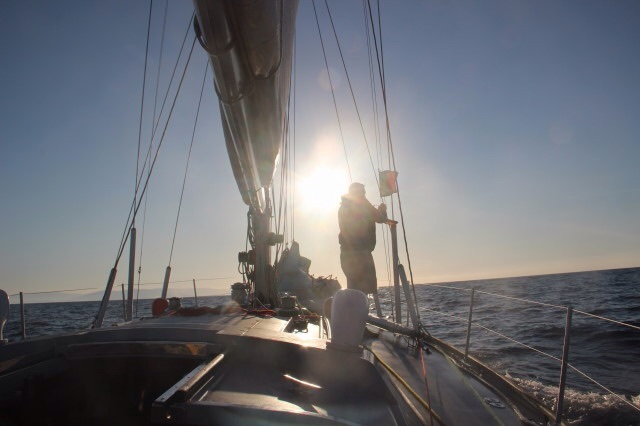 As dawn broke both watches had become highly proficient at tacking during the night and some wanted to push on – that’s how much the crew have embraced the experience of achievement and camaraderie of Offshore sailing.